Generally, crystals form when they undergo a process of solidification. Under ideal conditions, the result may be a single crystal, where all of the atoms in the solid fit into the same crystal structure. However, generally, many crystals form simultaneously during solidification, leading to a polycrystalline solid. 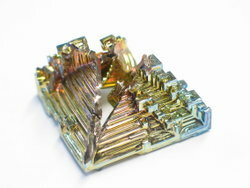 For example, most metals encountered in everyday life are polycrystals. Crystals are often symmetrically intergrown to form crystal twins. Which crystal structure the fluid will form depends on the chemistry of the fluid, the conditions under which it is being solidified, and also on the ambient pressure. The process of forming a crystalline structure is often referred to as crystallization. While the cooling process usually results in the generation of a crystalline material, under certain conditions, the fluid may be frozen in a noncrystalline state. In most cases, this involves cooling the fluid so rapidly that atoms cannot travel to their lattice sites before they lose mobility. A noncrystalline material, which has no long-range order, is called an amorphous, vitreous, or glassy material. It is also often referred to as an amorphous solid, although there are distinct differences between solids and glasses: most notably, the process of forming a glass does not release the latent heat of fusion. For this reason, many scientists consider glassy materials to be viscous liquids rather than solids, although this is a controversial topic; see the entry on glass for more details. Crystalline structures occur in all classes of materials, with all types of chemical bonds. 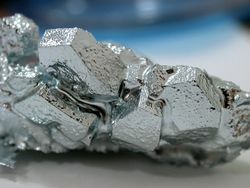 Almost all metal exists in a polycrystalline state; amorphous or single-crystal metals must be produced synthetically, often with great difficulty. Ionically bonded crystals can form upon solidification of salts, either from a molten fluid or when it condenses from a solution. Covalently bonded crystals are also very common, notable examples being diamond, silica, and graphite. Polymer materials generally will form crystalline regions, but the lengths of the molecules usually prevents complete crystallization. Weak Van der Waals forces can also play a role in a crystal structure; for example, this type of bonding loosely holds together the hexagonal-patterned sheets in graphite. Most crystalline materials have a variety of crystallographic defects. The types and structures of these defects can have a profound effect on the properties of the materials. 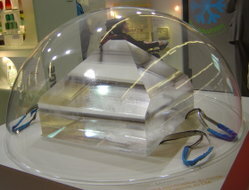 A huge monocrystal of potassium dihydrogen phosphate grown from solution by Saint-Gobain for the megajoule laser of CEA. While the term "crystal" has a precise meaning within materials science and solid-state physics, colloquially "crystal" refers to solid objects that exhibit well-defined and often pleasing geometric shapes. 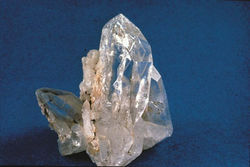 In this sense of the word, many types of crystals are found in nature. The shape of these crystals is dependent on the types of molecular bonds between the atoms to determine the structure, as well as on the conditions under which they formed. Snowflakes, diamonds, and common salt are common examples of crystals. Some crystalline materials may exhibit special electrical properties such as the ferroelectric effect or the piezoelectric effect. Additionally, light passing through a crystal is often refracted or bent in different directions, producing an array of colors; crystal optics is the study of these effects. In periodic dielectric structures a range of unique optical properties can be expected as described in photonic crystals. 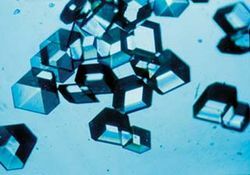 Crystallography is the scientific study of crystals and crystal formation. According to Rebbenu Bachya, the word "Achlmah" in the verse Exodus 28:19 means "Crystal" and was the stone on the Ephod representing the tribe of Gad. Crystals also figure or figured prominently as healing tools in a number of mythologies.